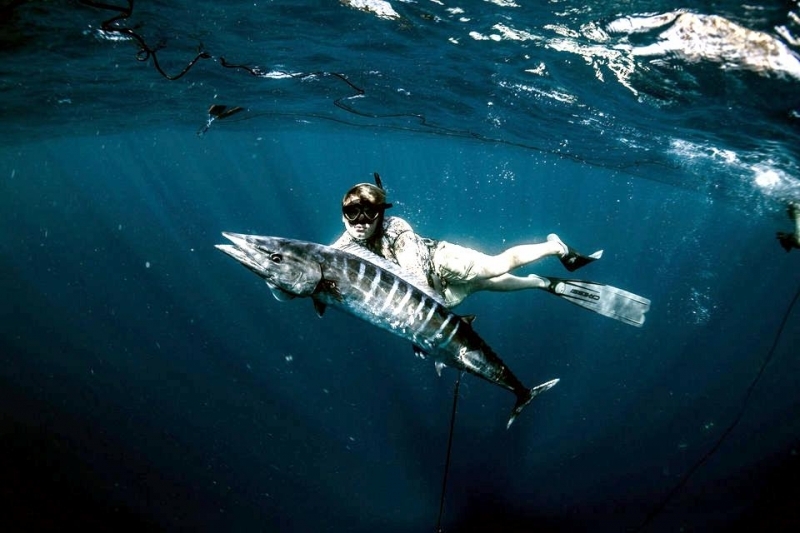 Wahoo are tropical oceanic speedsters encountered by sport-fishers throughout the world. 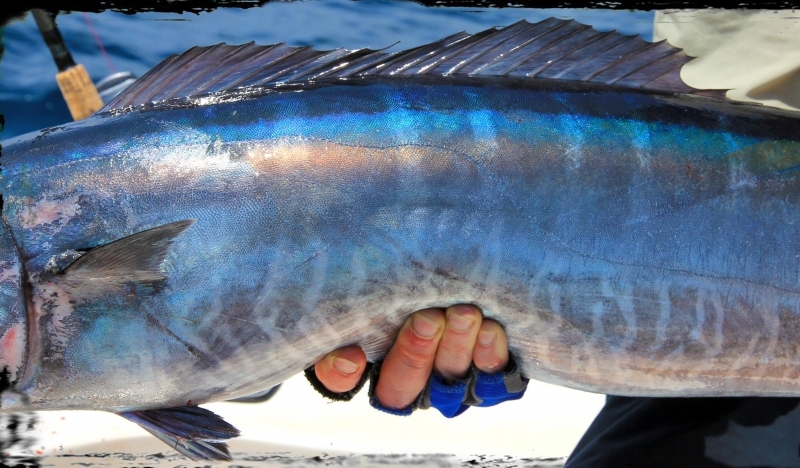 Wahoo are usually found in small groups or individually around offshore reefs, coral drop-offs and other pelagic features such as current lines. 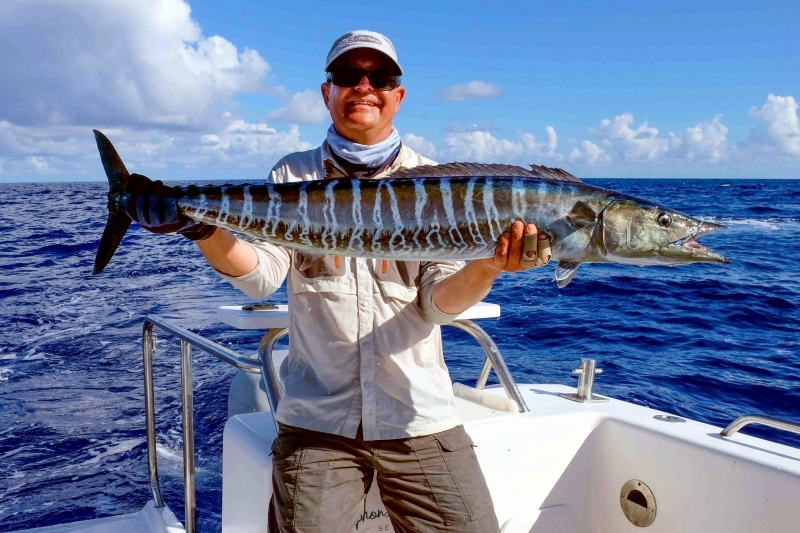 With their small but incredibly sharp teeth, long streamlined bodies, high aspect ratio tail fin and brilliant cobalt blue stripes, to describe a Wahoo as a hot-roding Mackerel is probably not too far off the mark. 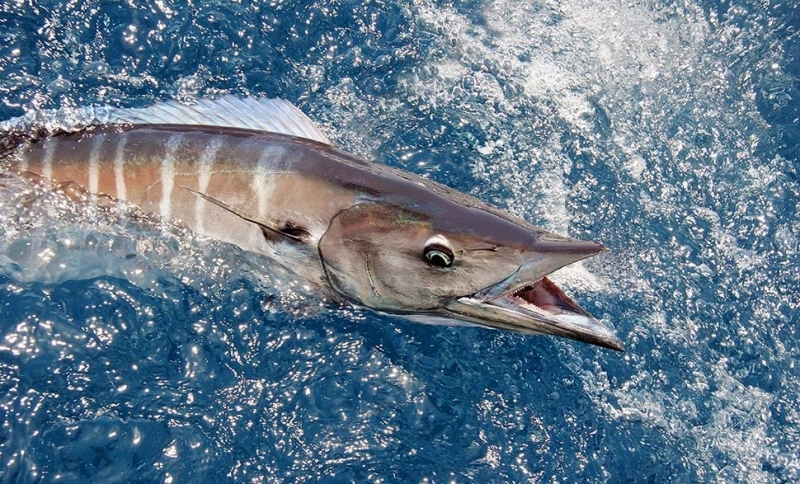 The Wahoo is known as the Wahoo worldwide. 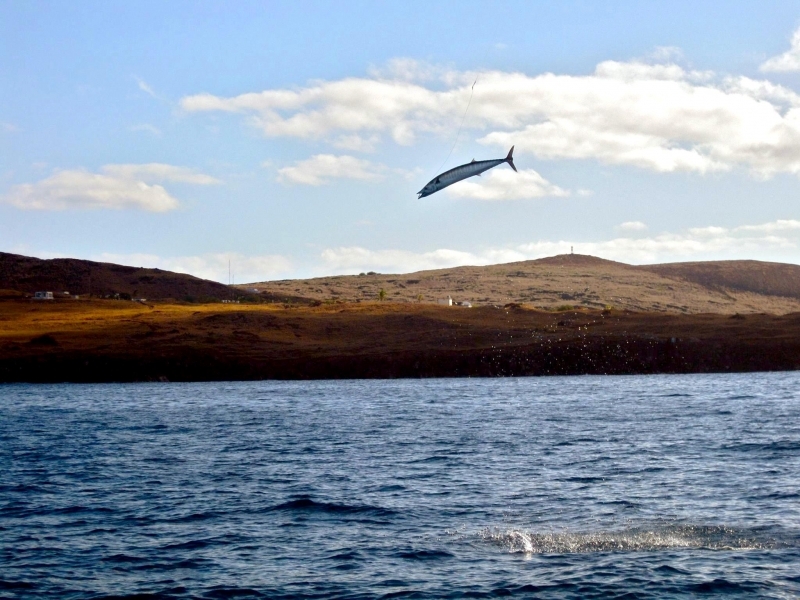 This is possibly because when European explorers first mapped out the Hawaii islands, they discovered that the Hawaiian fish is plentiful around the island of Oahu. 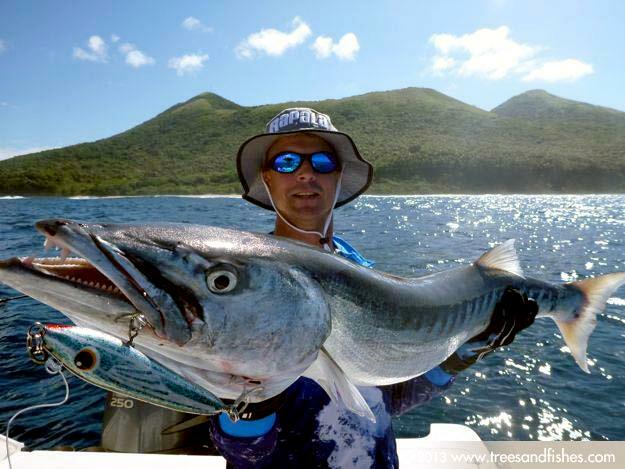 Oftentimes, Oahu was misspelled (by the European explorers) as Wahoo. 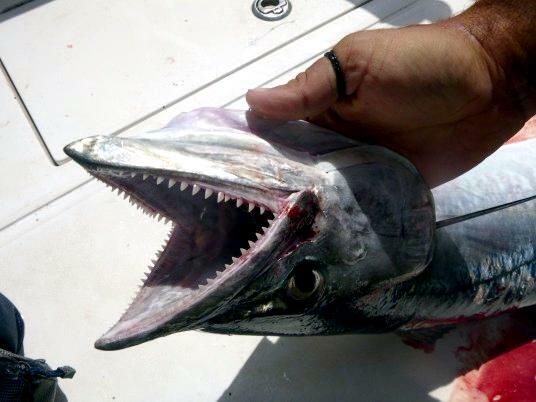 This is where many people believe the origin of the Wahoo’s name is from. 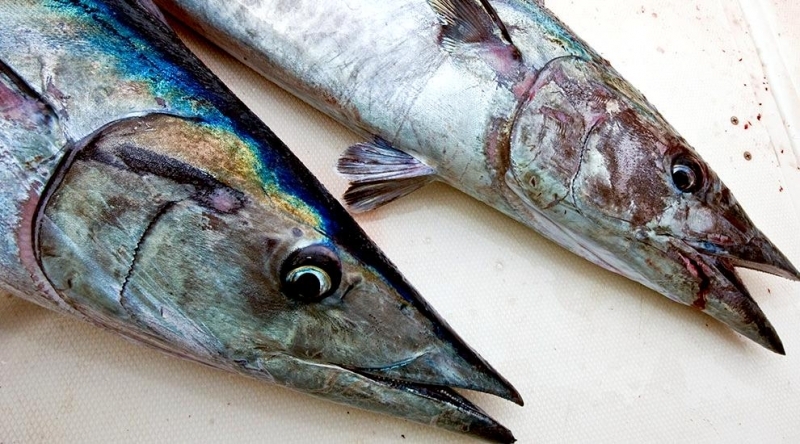 However in Hawaii, the Wahoo is known as the “Ono” fish and means “delicious” or “good to eat”. 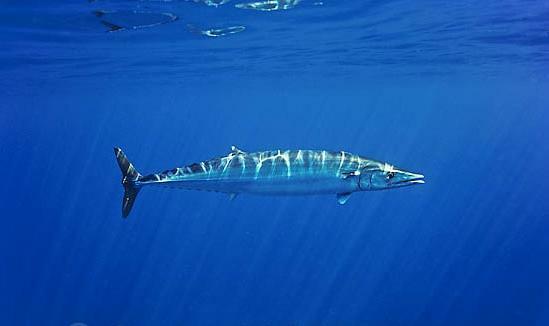 The Wahoo is found worldwide in all the tropical & subtropical seas. 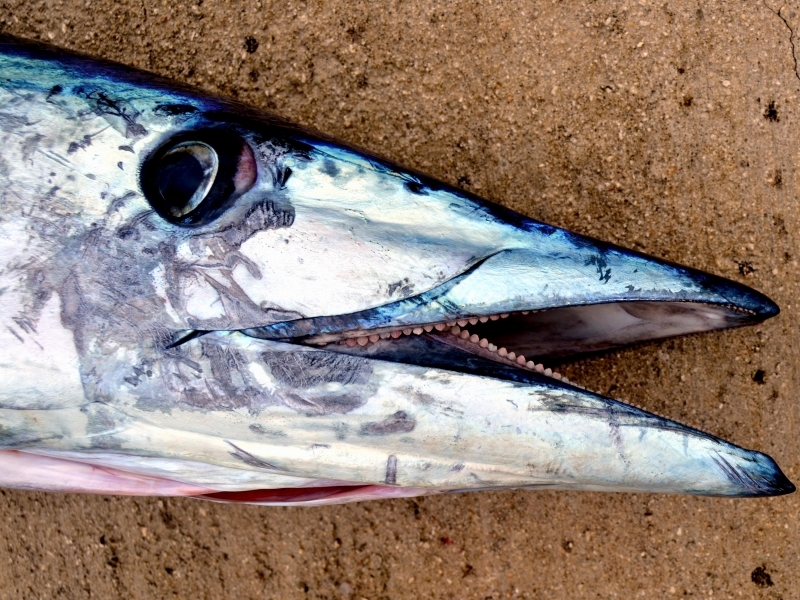 The Wahoo is capable of eating fish larger than themselves. 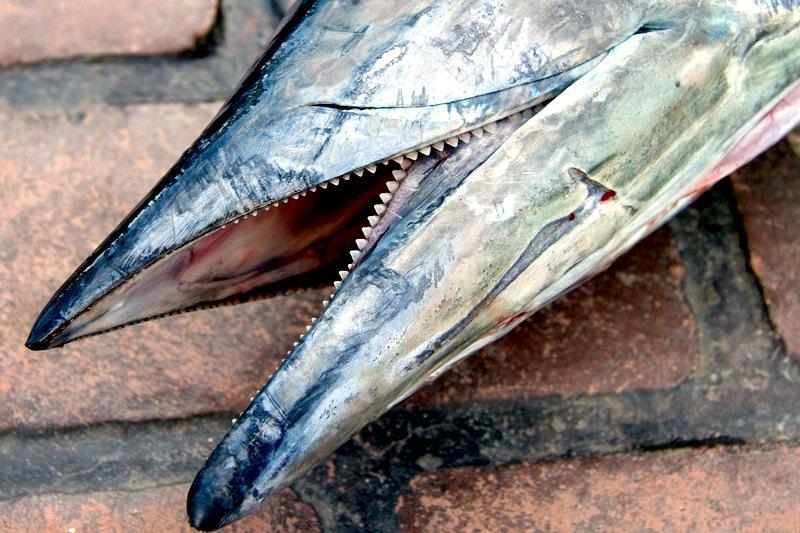 The Wahoo’s sharp teeth possibly make it easier for them to both catch & chew up the larger fish into bite sized pieces. 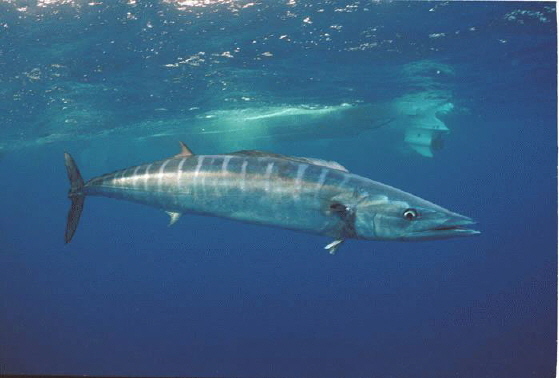 The Wahoo typically goes after many types of fish as well as squid. 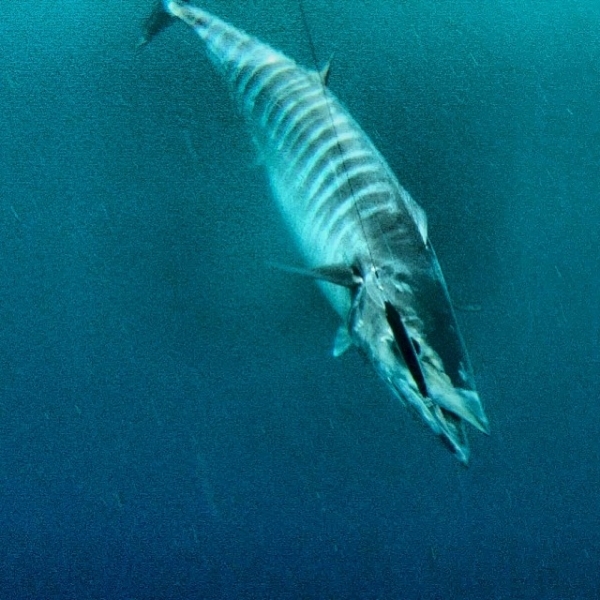 Despite their mackerel-like appearance, some early scientific studies suggested that Wahoo were closely related to billfish because like Marlins, they lack gill rakers. 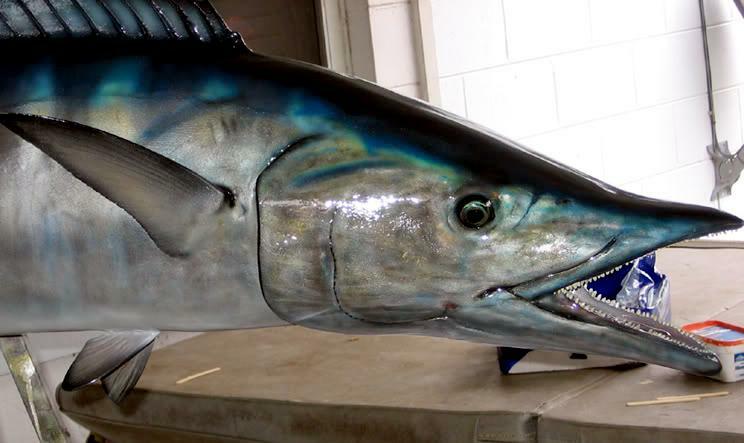 However, later studies and recent genetic work have confirmed that Wahoo are related more closely to scombrid fishes such as Mackerels & Tunas. Female Wahoos are longer than the male with an average of 3.3 feet in length for the female and 2.8 feet for the male. 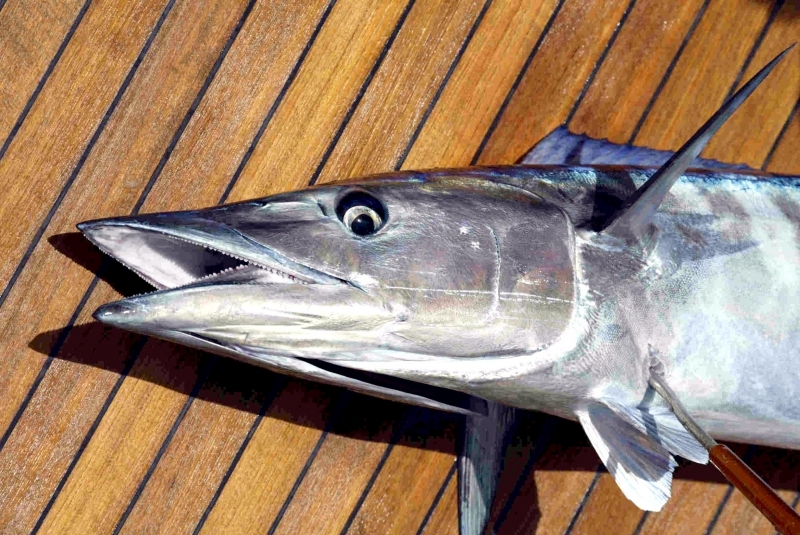 Wahoos can weigh up to 100 pounds and also grow fairly fast as one study tagged a Wahoo, released it and found that it had gained 22 pounds in 10 months. 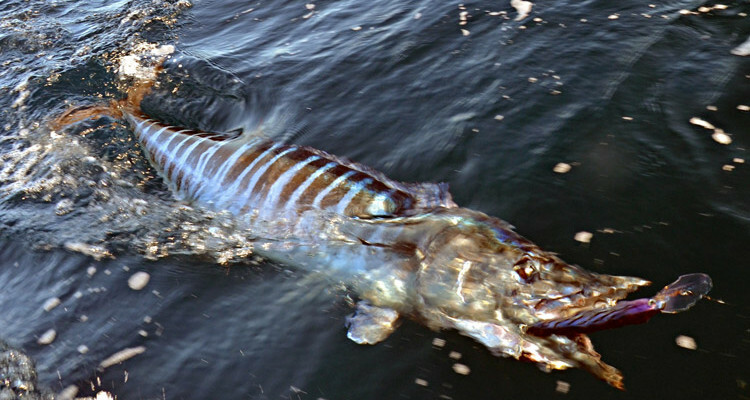 The Wahoo is known for its speed. 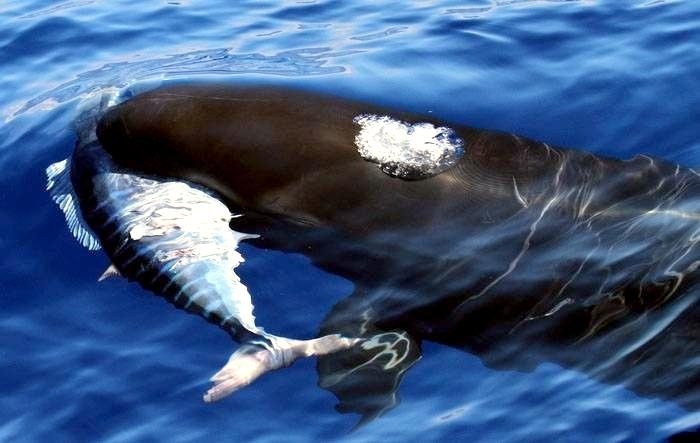 It can reach up to 60 mph on the open sea, which makes it easier to both escape their predators and catch their prey. 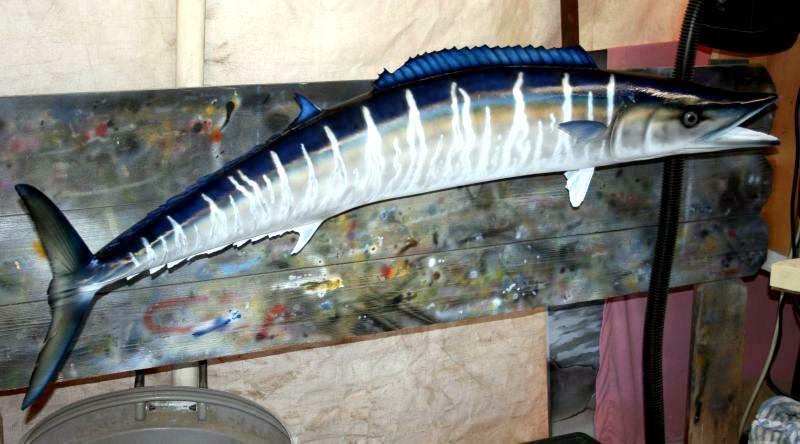 The Wahoo is fairly solitary. 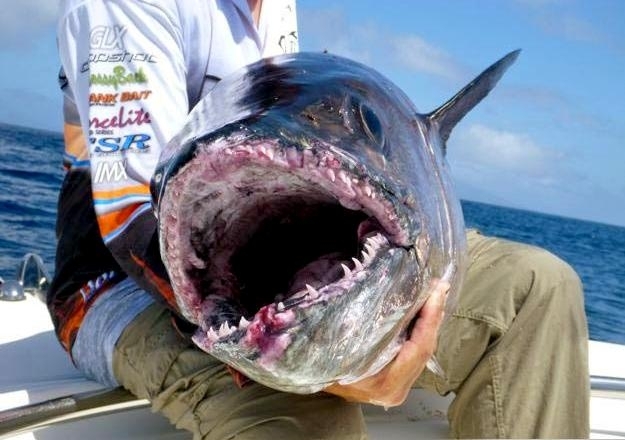 They are never found among large schools of their own kind, the most you will see at once will be Wahoo composed of loose knit groups that typically only have 2 or 3 fish. 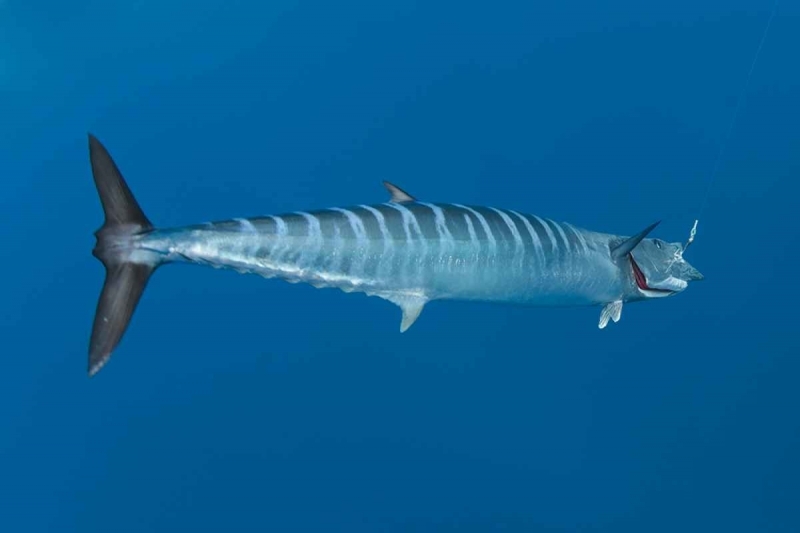 On the subject of genetics, researchers from the USA recently completed a study of the genetic structure of Wahoo populations from around the world. 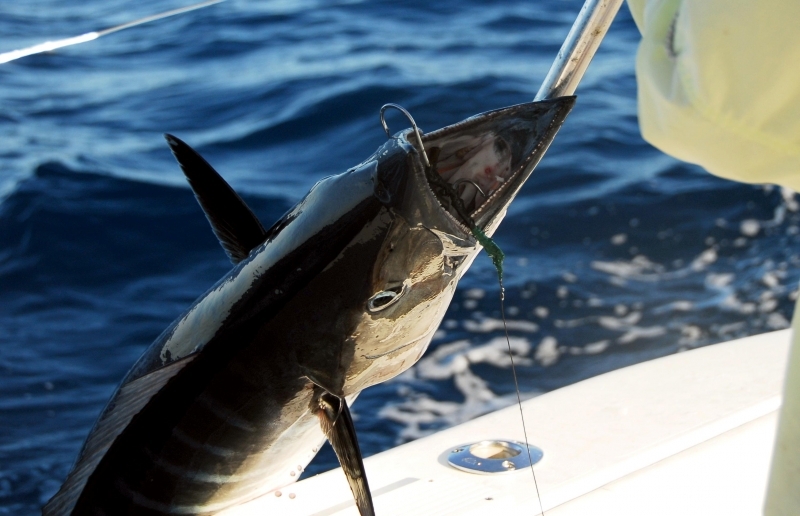 They found no significant genetic differences between samples taken from Wahoo all over the globe, which was a surprising result considering that most other tunas, billfishes and oceanic sharks exhibit significant population structure between the worlds oceans. 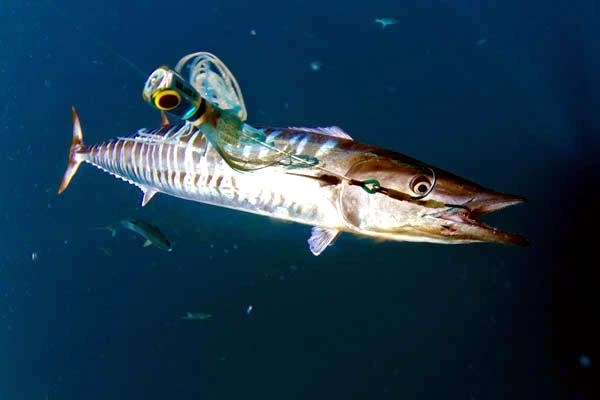 This suggests that adult Wahoo and/or their larvae move freely from the Indian Ocean both eastwards to the Pacific Ocean and westwards around the Cape of Good Hope into the Atlantic Ocean. 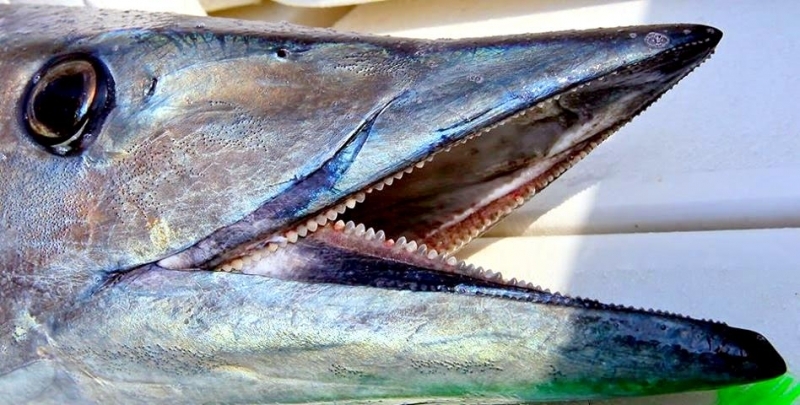 The USA researchers claimed their findings demonstrated that Wahoo are the first known vertebrate with a single globally distributed population. 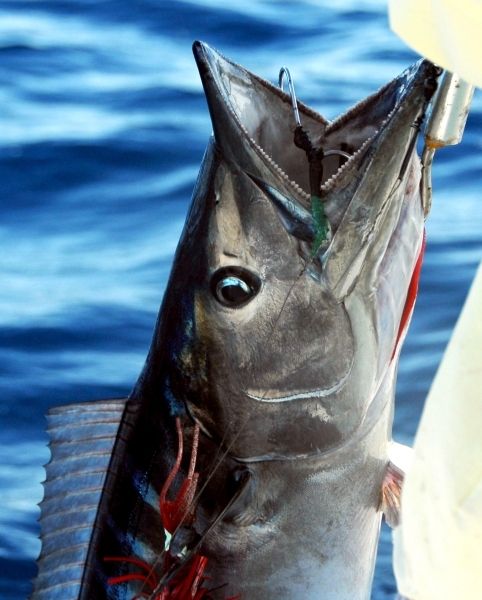 Like most other oceanic pelagic fish, Wahoo are a fast growing, short lived species. 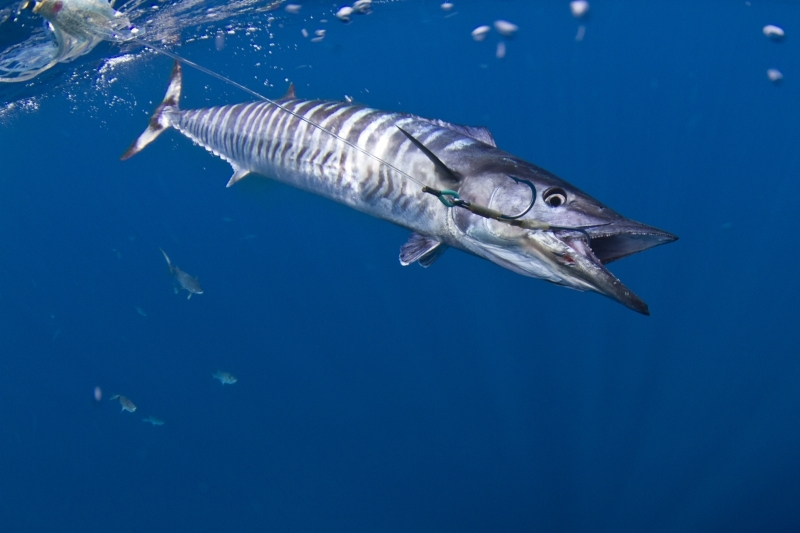 A recent study found the average lifespan of Wahoo was less than 2 years, with the size at maturity being 92 centimeters for female fish, a size achieved in their first 7 months of life. 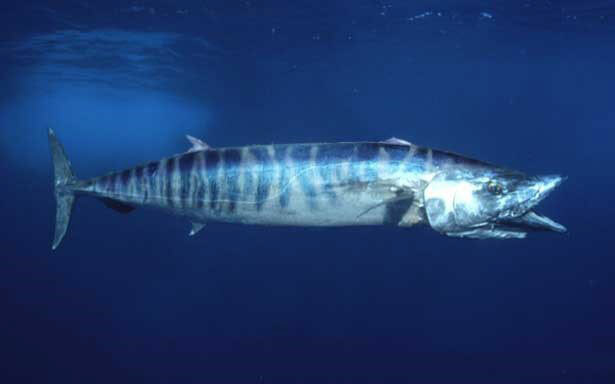 One tagged fish in the Caribbean, grew 10 kilograms in 10 months while the largest Wahoo over 1.6 meters long are mostly females that can grow to around 2 meters long and live for up to 9 years. 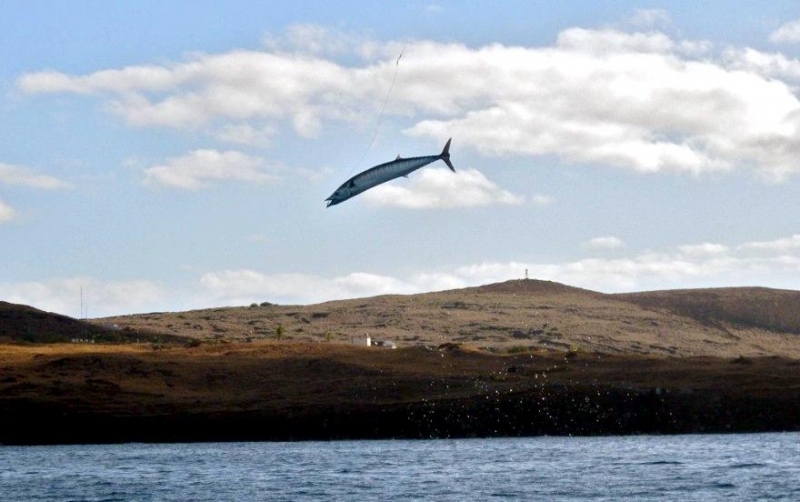 This phenomenal growth is fueled by a diet consisting almost entirely of fish, particularly pelagic bait-fish but also small tunas, flying fish & squid. Spawning may be restricted to specific areas and times however. 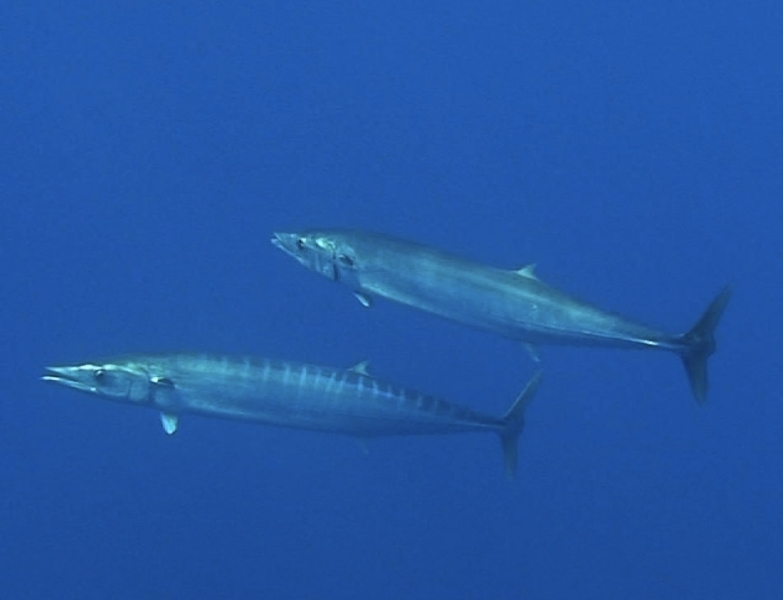 Wahoo have quite high fecundity, with over 6 million eggs per batch spawning being estimated for a 131 centimeters long, 2-3 year old female and up to 100 million eggs per season from larger females. 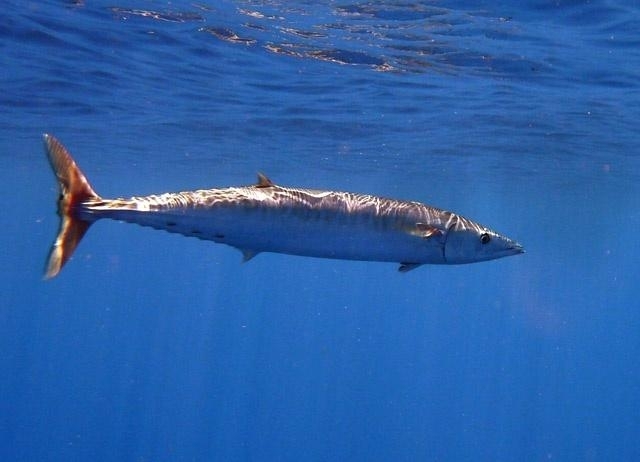 Besides their sweet eating qualities, Wahoo are renowned for their speed. 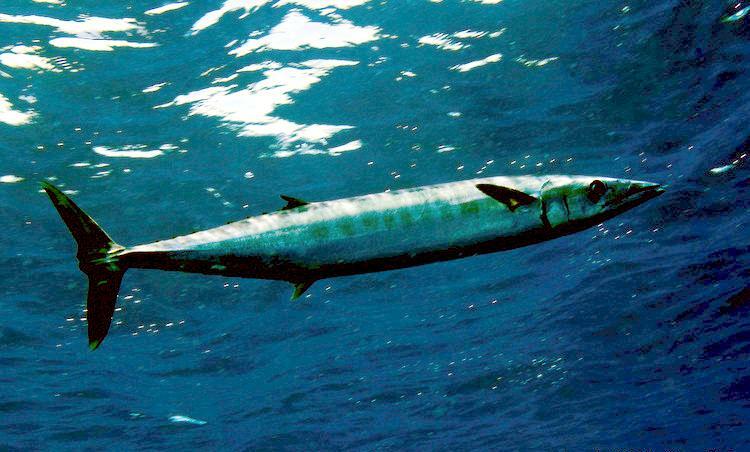 The Wahoo’s burst swimming speeds are among the highest of all fish. 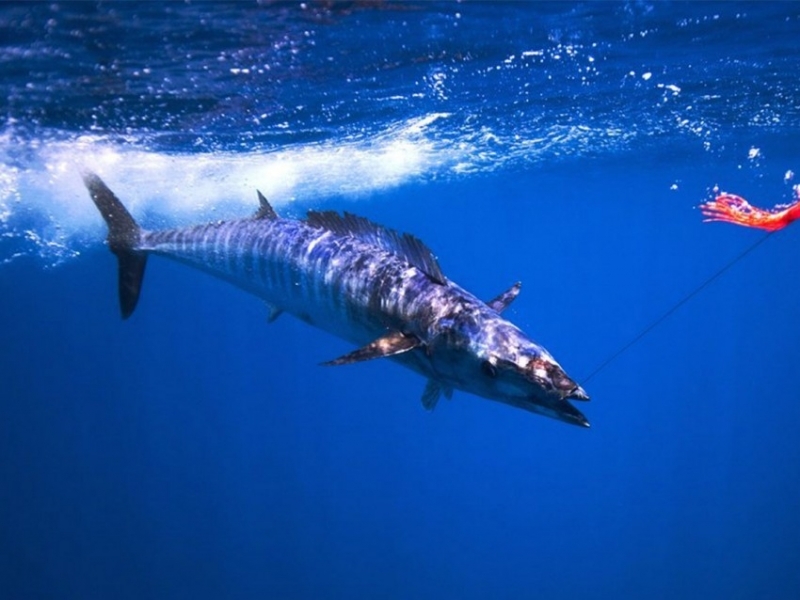 As far back as 1964, scientists from the University of California measured Wahoo swimming speed using modified sport fishing gear. Their technique was quite ingenious, given microcomputers & satellite based tags didn’t exist at the time. They used an overhead reel with braided linen fishing line marked with iron powder at inch intervals and measured the rate at which the line exited the tip guide using a magnetic pick up like those used in tape recorders. 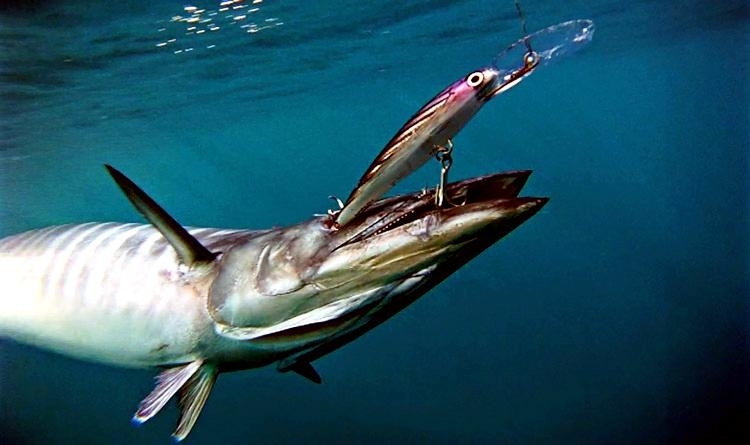 Using this primitive gear, they found that a 113 centimeter Wahoo reached a peak speed of 77 kilometers per hour or 18.9 body lengths/second within the first 10 seconds after hookup. That’s over 21 meters a second. 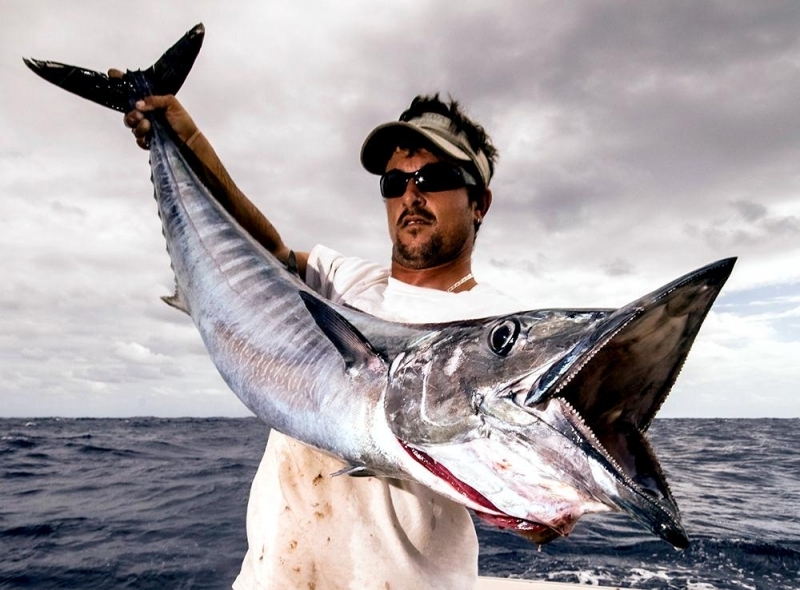 With a growth potential of over 2.1 meters and 83 kilograms, it seems possible that a large Wahoo could reach or even exceed a burst speed of over 100 kilometers per hour, a mark which might be exceeded only by the much longer billfish family (Marlins, Sailfish & Swordfish).